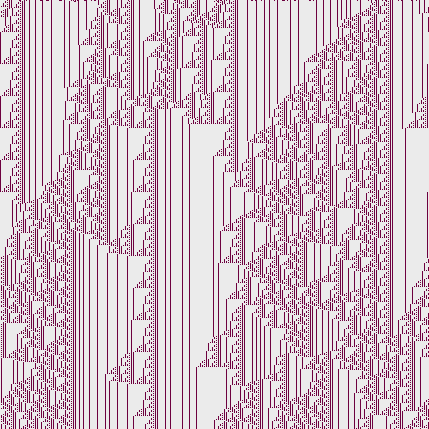 Of all the things that the Genetic Art java program Kandid does, I had always found (until recently) it’s cellular automata features to be the most enticing and the most disappointing. 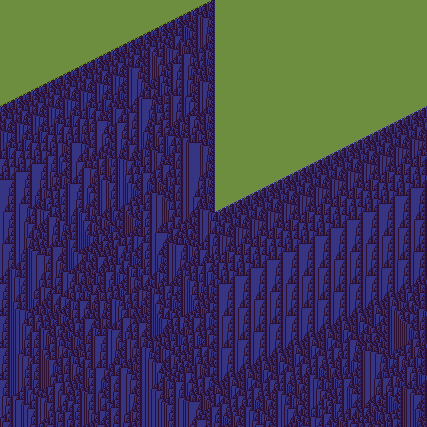 The cellular automata, true to their synthetic, space age name, looked very computer-ish and although the high contrast color palettes complimented this quite well there was one big problem: everything it came up with all looked the same. 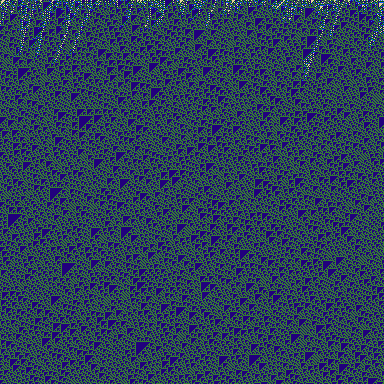 This is a common problem with generative art, but with some persistence one can often find ways to direct the machine in more profitable directions. Kandid being a genetic art program, it works by choosing two images and creating a new generation of images based on variations of their parameters. In Kandid these parameters, sensibly enough, are called chromosomes. You can’t play with the chromosomes but you can combine them (i.e. breed them) with another set and adjust the environment in which this happens by altering the values for mutation, cross-over and scale. Unfortunately, cellular automata (CA) images aren’t scalable due to the nature of the mechanism by which they’re made; you’re stuck with the size of the image and that appears to be limited to about 427×427 pixels. Fractals have the ability to redraw the details within an image at a larger size, that is, you can zoom into them, but CA actually create a unique pixel collection that is a function of the size of the image. So they’re pretty much a what you see on your monitor is all you’ve got. I found this out by trying to “breed” a little one with a big one. It’s nothing like breeding horses or dogs. After a few runs that simply repeated the usual boring results, I started to get reckless and contrary to what common sense would dictate, breed the ugly, sickly, lame ones with the good ones. That was how I made my break-through. Sometimes I would breed what looked to be a completely empty image, nothing but a solid square of color, with something more appealing. Other times I would add something really simple and dull to the gene pool. These new combination lead to new outcomes and I think that’s one of the keys to working with these generative/computational/algorithmic programs: explore and experiment. While human intervention can take computational imagery and rework it into a more attractive form, the artist most often erases or dilutes the very aspect of computational imagery that makes it unique and stand out from the rest of the “art” world, which is its mechanical creativity. It might “look better” when the artist gets done, but ultimately the effect is to produce imagery that is already common place and lacks the freaky appeal that is the direct result of the non-human and untouched by human hands computational process. I think perhaps that fractal artists can be separated into two camps: those who seek the wild, untamed imagery that grows ready-to-pick from cold, mechanical algorithms; and those who want to use that sort of imagery, domesticate it, so to speak, and utilize it as the raw material in their own creations. Except it isn’t really their own or really very creative. In fact, I would say that such a traditional approach to creating art is more imitative and results in images that resemble “typical” artwork. This probably sounds strange to many artists because isn’t expressing one’s “creativity” what art is and has always been about? Yes, that’s true, but now there’s something better. I believe that better art, more “original” art, will be made by artists interfering with the machine less and spending their time trying to find good imagery instead of trying to construct it themselves. I think the forte of fractals and other types of computational imagery is their artificial, mechanical style and that this contrasts greatly with the human touch which artists, well-meaning but misguided, want to add to “make it art” or to make it “personal”. Computational art is more sophisticated. Picasso’s Guernica, a fine example of “typical art”, is quite predicable and follows the well worn trails of tradition. Picasso expresses the horror of the bombing and captures the human tragedy and suffering and manages to place the actual historical event of Guernica unavoidably in the middle of our collective town square, literally like a billboard, so that it will never be forgotten. The style in which Picasso painted was new back then but now it’s old. The lasting impact of Guernica is the way it memorializes that historic and shameful event and exemplifies the power of art to express and influence social and political thought. A noble thing to do, but from my perspective also a rather primitive one. Artists are always doing these things, noble though they may be, they are also less interesting because they are so common. I actually feel that paintings that are difficult to understand have more lasting appeal because they’re perennially open to new interpretation (or any interpretation). 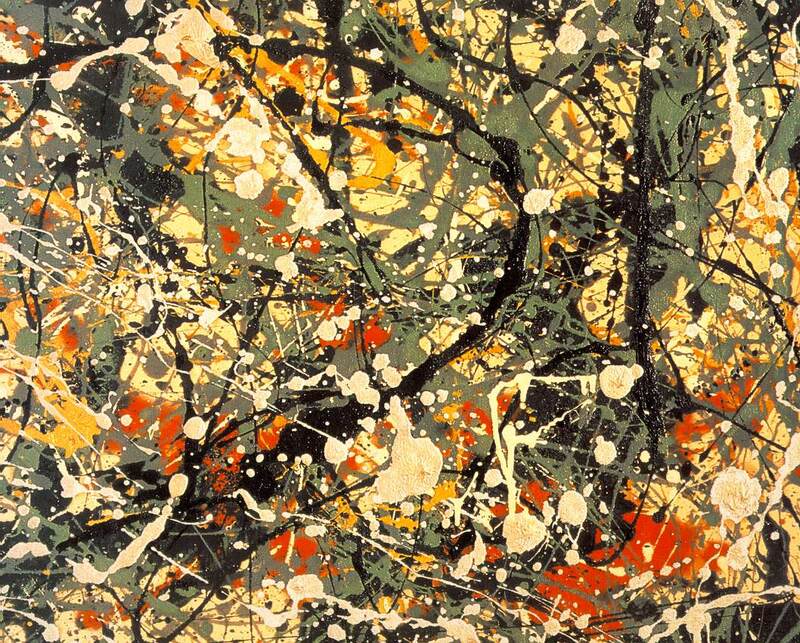 Pollock’s drip paintings have that eternal quality. Computational processes lack the intelligence of the human mind, the mind of an artist, and thereby produce things that are unpredictable and unconnected, unrelated to traditional art and (when they look good) produce works that are refreshingly unique and much more creative. I like to think of computational art in a musical sense as being “strange new chords” –combinations of notes that musicians, especially well-trained musicians, would never create or attempt to create, but once we hear them we marvel at their ingenuity. Bold and new –that’s the essence of creativity. The opening chord to the Beatles, A Hard Day’s Night, was created haphazardly and today is difficult to reproduce because even John Lennon, who composed it, couldn’t actually remember the precise combination of notes he played or how he strummed them to get that same sound. I heard this in a documentary where Ringo Starr recounted the original event that took place at a recording studio. What makes machines so “talented” is that they don’t really know what they’re doing: they are unreflective and unthinking. That’s why I say that artists who use fractal imagery to contruct more elaborate images of their own creative designs are hopelessly doomed to repeat what others have done. Once in a while someone constructs something interesting, but the artist’s contribution most often obscures fractal art rather than enhancing it. (This is part of what Terry was getting at when he noted that many DA artists made better work in their early days.) Machines have no such bad habits, or any habits at all, and the best ones are idiot savants performing amazing feats of computation and yet unable to draw the simple pictures that any child can. The job of a computational artist is to push buttons and turn dials. Everything else is folly. 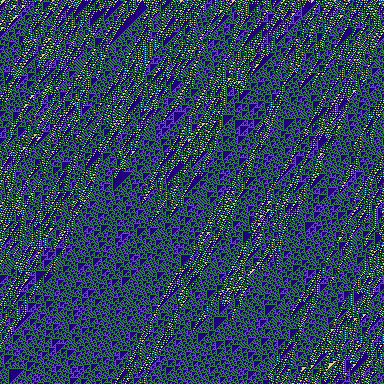 A corollary is that the aim of a computational artist is making a choice within the raw material produced by a stupid machine. This may appear as a paradox, but it is mostly true. Actually, the first and most important step in the production of computational art is making choices. Here is the human touch, which can change a raw, calculated image into something else!